My name is Paul and I thought putting out music on your own is the best thing that you can do in life beside doing your own music, get children and drink a lot of coke. The exact start of the label is not really known so I decided to take February 20th in 2008 - it was the 7oth birthday of my grandpa. Meanwhile I moved from Rostock to Hamburg, St. Pauli. In summer 2016 my brother Robert joined the label to handle all of your orders. It was also the last summer of my grandpa. In the same time my girlfriend Janne helped more and more with graphic stuff and so in 2018 we are 3 who are more or less involved in this label. We are total vinyl and music nerds and we know what it means to order a record, to wait for an order to arrive and to bother labels/distros when something went bad. We really love to get orders from you and any support is highly appreciated!!! 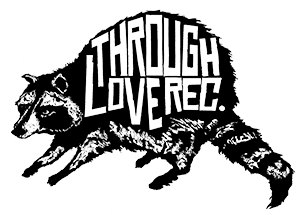 Through Love Records supports a feminist and anti-fascist diy culture. Fleet Union (www.fleetunion.de) - Our PR heroes from Hamburg/Cologne. Lucas Mayer (www.lucas-mayer.de) - Our grafic and webmaster hero.